Do you have plenty to say and tons of ideas, but freeze when you have to put them into writing? Would you rather face a zombie apocalypse than face past participles, or gerunds, or consider whether it’s cool to end sentences with prepositions? Me too. Writing should be fun, and I’m here to help you with that. You can do this. Writing is a skill, which means anyone can learn the basics and, with practice, become good at it. You CAN write more clearly and communicate more effectively. All you need is a foundation. 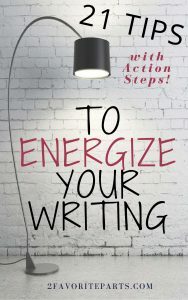 In my free ebook, “21 Tips to Energize Your Writing,” you’ll get help solving some of the most common stumbling blocks to good, clear prose. 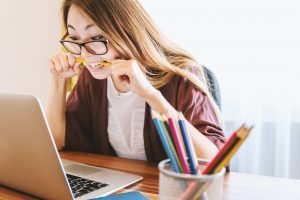 This easy-to-read guide is packed with fun tips that you can refer to whenever you have a question or need to insert a little oomph into your writing. With more than 24 years of professional writing experience, I’ve had a lot of practice. And as a former newspaper reporter, I’ve been subject to ruthless editing, which means I’ve learned a few things along the way. Two of those lessons (and yes, this relates to writing): don’t take things personally, and always keep your sense of humor. That’s the flavor of this book: 21 Tips, delivered with a smile. Or maybe a smirk. So grab the tips today, and be spared the ruthlessness!